In the bouquet of Indian festivals, Holi is the festival of colors, the celebration of love holds a special and a unique charm, giving a wonderful occasion for enjoying with near and dear ones, mainly, the festival symbolizes about commemorating the victory over evil. Holi has a long tradition in India and that’s why Holi is celebrated in India. This incredible festival is celebrated with much gait and fervor. In the diversity world, the festival gives a glimpse of its extraordinary vibrancy and projects out a wonderful exhibition of diverse hues. People celebrate the festival with burning of demon Holika with the protection of Prahlada by Lord Vishnu which reveals the Holi, festival of colors in Indian history. The festival of Holi in India signifies the arrival of spring, end of winter, forget and forgiveness and helps in building broken relationships. Holi starts on the evening of Purnima (full moon day) in Vikram Samvat (i.e Hindu Calendar month of Phalguna). 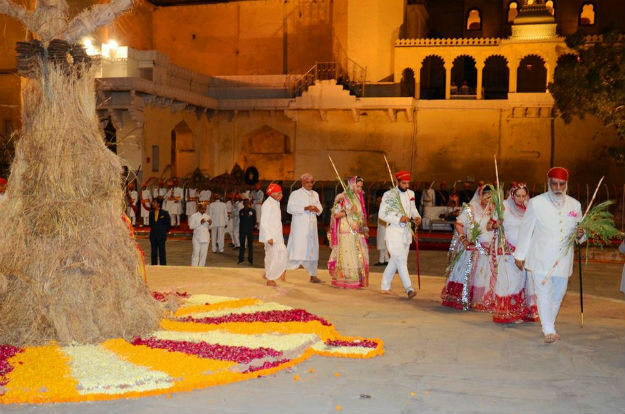 The festival is celebrated in two ways, Holika Dahan or Chhoti Holi and Dhuleti, Dhulandi or Phagwah. The celebration starts on the night before Holi with Holika Dahan where religious rituals happen in front of the bonfire. Holika Dahan is auspicious part of frolic festival Holi.” Holika “sister of the king of demon” Hiranyakashipu” depicts the evil inside you, Dahan means submission to big and eternal power. According to Indian mythology, Holika was incapacitated by Lord Vishnu in the fire when she was trying to burn and harm Prahlad “ (devotee of Lord Vishnu). Thereon every year Indians all around the world, burn effigies of HOLIKA in form of some old trunk and stick and burn it at the corner of the street, illustrating the submission of evil inside them In holy fire. Holi story in short: History of Holi Festival starts here. According to Hindu mythology of Bhagavata Purana which reveals all the Holi festival history, Hiranyakashipu was the king of demonic Asuras and had earned a boon which made him gain five special powers. He asked everyone to worship only him. But his son, Prahlada disagreed and devoted Lord Vishnu. Infuriated Hiranyakashipu gave cruel punishments and finally Holika, Prahlada’s evil aunt tricked him into sitting on a pyre with her. As the fire roared, Holika burned while Prahlada survived. At this time of dusk, Vishnu appeared and eviscerated and killed the king with his lion claws. 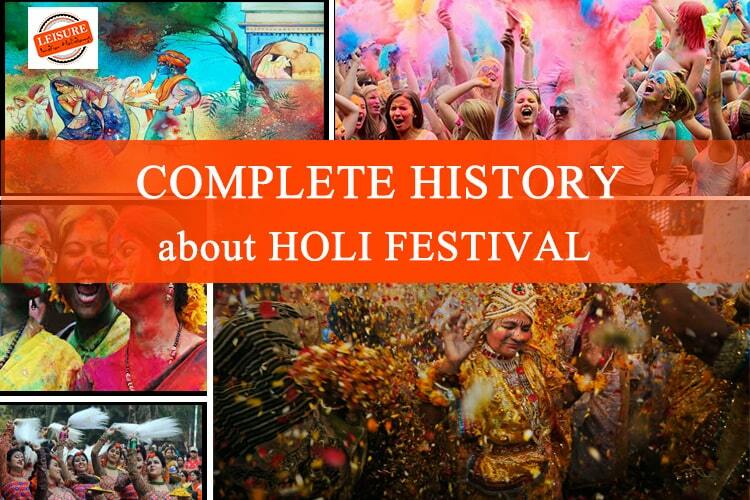 This is the history behind Holi celebration. People also believe about the Hindu deity Krishna, for which Holi is called Rangpanchami in commemoration of divine love of Radha. The dark skin of Krishna always despaired about his likeness of girls towards him for which his mother asked him to approach Radha and color her face with the color he desires. Since then, the coloring of Radha’s face came to be Holi. This is the main reason for celebrating Holi. 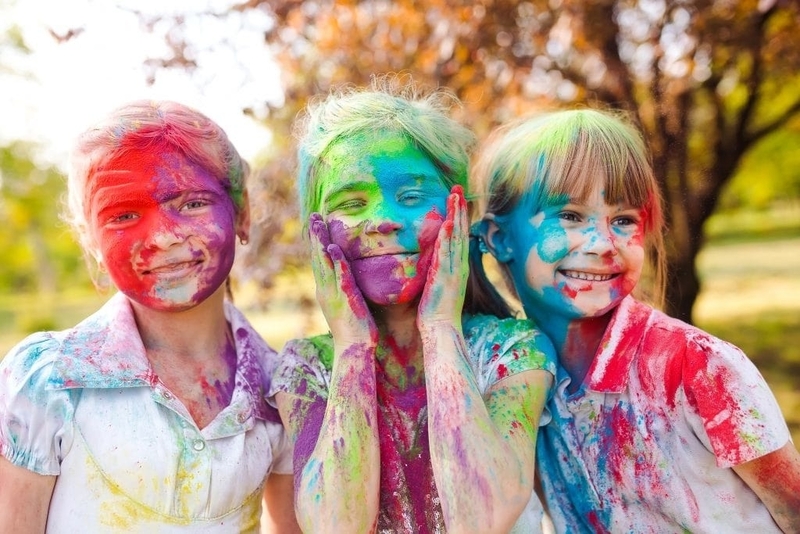 What do The Colors in Holi Represent? Although celebrating the festival is common but the mode and the protocols of celebrating vary with the variation of place and regions. 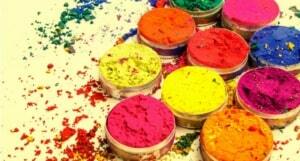 But the most common practice observed and followed is using ‘Gulal’ or colors in the form of dry powder. Holi is a festival of colors. Even watercolors are being used. ‘Gulal’ is the local language a significant part of the celebration is custom made color preparation from various ingredients. Such components have changed over time. Artificial sources of chemicals have taken place over natural elements like vegetable and plant sources, flower petals, etc. which were used in olden days. There are many types of Holi celebrated in India and the mythology states the beginning of Holi festival first observed and started in the Barsana region of India including Mathura, Nandgaon, Vrindavan, and Barsana. In the village of Barsana, Uttar Pradesh, the local name was given to the festival is “Lathmar Holi.” The tradition followed in the village is about women chasing away the men with lathis, but it can’t be said as beating session. In the region of Uttarakhand, Kumaon region, where people call “khadi Holi” where people move in toils singing Khari songs and wearing traditional clothes. In Punjab, it is mainly called “Hola Mohalla” or warrior Holi, observed by Nihang Sikhs and exhibit martial arts. People of Odisha and West Bengal commonly call Dol Jatra and Basant Utsav. People welcome spring season during this time. While youth put up saffron colored clothes and celebrate with immense joy in Shantiniketan, at the same time, on Dol Purnima idols of Radha and Krishna move in a procession. Farmers of Goa dance like traditional folks in the streets and call the festival as “Shigmo.” Thabal Chongba, a dance of Manipur is observed from the day of full moon, combining Hindu and indigenous traditions. In Kerala, Manjul Kuli is celebrated in Konkani temple of Gorripuram Thirumala. Bihar region celebrates Holi in the name of Phaghwa while Assam celebrates in the name of Phakuwah. People celebrate the festival of love with savoring lip-smacking sweets and various delicacies. Various traditional food items are starting with Gujiya, Dahi Vada and ending with Kesari Malai Peda and Bhaang; people celebrate with immense joy and happiness. Different deceptively simple looking drinks gives tremendous flavor to the festival and escalate the spirit of. Dhuska, a Bihar dish with a crunchy and mildly sweet taste, Bhaang Thandai, Guijya, Moong Dal Kachauri, Malpua with the flavor of cardamom with sweet khoya, Dahi Vada are major food items. Every festival ends with satisfying hunger. 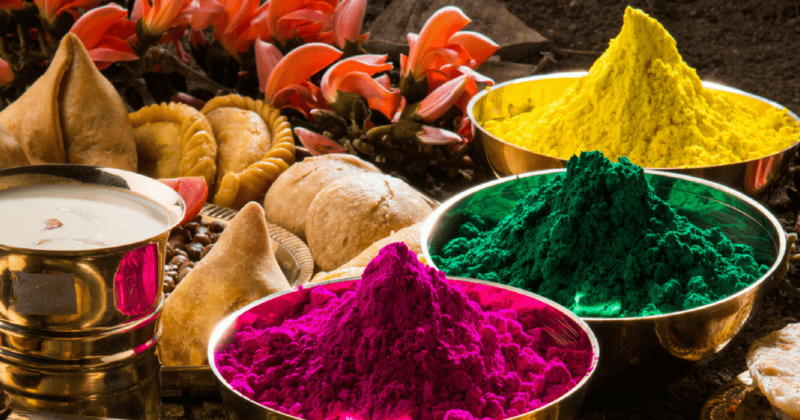 The Holi has its enjoyment in the lavish and tasty food. People eat sweets and satisfy their hunger and speak out the stories of Holi in their communities and family members.